Home » Website Building » Weebly » How to Add Colored Text box in Weebly Site? How to Add Colored Text box in Weebly Site? Weebly by default offers Title and Text elements to add text content to your site. These elements will look very simple and there is no default option for adding a customized text boxes to your site. In this article we explain how to add colored text box or paragraph in Weebly site with different colors. Padding and margin attributes are used to align the text within the box and create the required box height. You can add your own text and customize the color according to your page layout. The color code can be a hexadecimal code like #808080 or use direct colors like “skyblue” or “grey” instead of the code. You can use any kind of HTML tags inside the text box, for example below is code and sample box for linking a webpage using anchor tag. If you are modifying the source HTML/CSS then you need to save your theme with a new name. When you switch to any other standard theme you will lose all the changes and need to change the CSS of that theme again. The following steps will explain you how to put this paragraph on your website. Go to “Edit HTML/CSS” option available under “Theme” tab of the Weebly editor. Add the following code anywhere in the “main.less” file available under “Styles” section. You can customize the color and fonts to suit your site theme. Once you are done then drag and drop “Embed Code” element in your site where you want to add a text box. Paste the below code inside the embed code element. 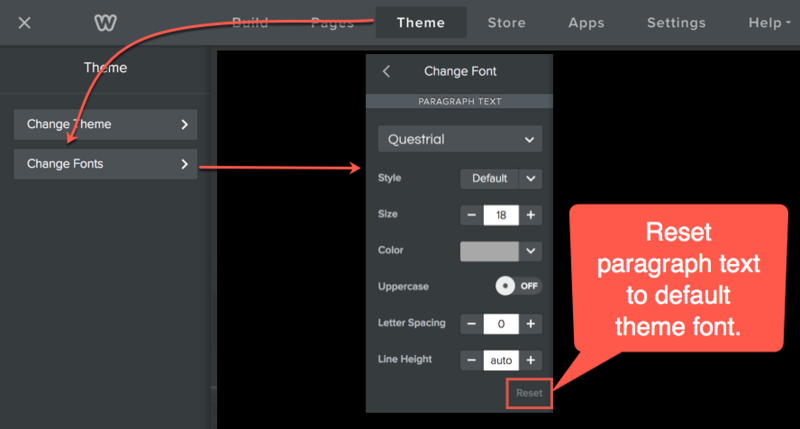 In both the above methods, there is a possibility of the font mismatch compared to your theme’s font. If you do not see the fonts properly in your text box, ensure to reset the paragraph font settings to default. This can be set with the “Change Fonts” option available under “Theme” tab. Select the paragraph text and click on the “Reset” link to change the fonts to the default settings as shown in the below picture.